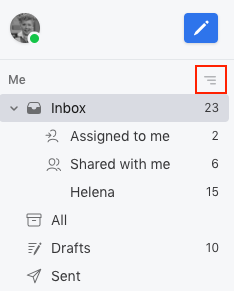 Front allows you to change your inbox counter settings, so you can choose what the numbers on your inbox show to better accommodate your workflow. In your individual workspace titled Me in the top left corner, click on the Workspace options icon (the three horizontal lines). Click Counters to open your counter settings. Choose the counter type you want to display for your individual inbox, either Unread or Open. Note: These counter settings only apply to your Inbox and sections within it (Assigned, Shared, your individual email). 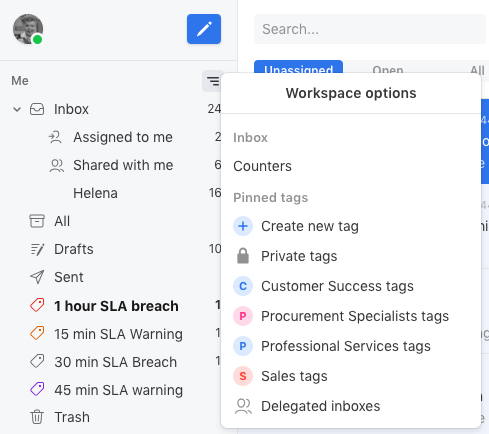 If you have pinned tags to your workspace, your tag counters will always show the number of open conversations, even if you have set your inbox counters to unread. In the team section, click the Workspace options icon (the three horizontal lines). Choose the counter type you want to display for your team inboxes, either Unassigned or Open. Because Front is a collaborative email tool, the number of unassigned conversations in team inboxes can be modified by any teammate with access. This means that the counters you see in the application are not calculated locally, but are actually counters stored in our servers based upon events received across your team. Those counters can sometimes fall out of sync with the conversation list if any events are missed. 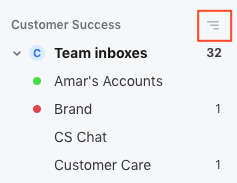 It doesn't happen often and is easily rectified, but in the event that the inbox counters do not correctly represent the number of conversation there are in the inbox, please contact us to have your counters reset. 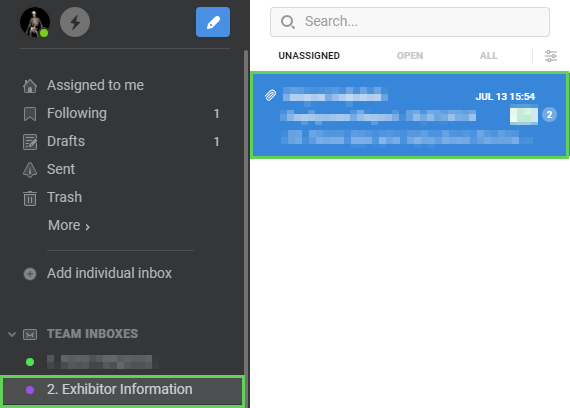 Our Inbox is no longer showing counters for 'Unassigned conversations'. The counters work for 'Open conversations', but when I change to 'Unassigned' I no longer see any numbers. This has been working for some time, but appears to have stopped working recently. Hi Jem Wilkinson we'll get right on this for you. If this ever happens in the future or you have an issue related to your specific account, shoot us an email at support@frontapp.com so you don't need to share any private information here. I'll send you a follow-up email once we've looked at this for you! Is there a way to see the counter for all?